StickerGiant prints labels for bottles, and our Customer Success Team can help you choose which type will work best for you. You can choose from Glossy White, Clear, or Matte options to find a type that matches your products perfectly. 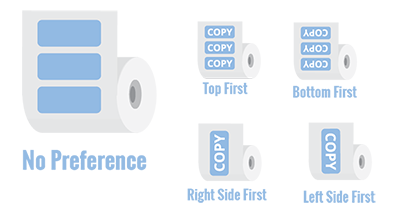 We can orient your product label on the roll in 4 different copy positions. Our lamination for our Glossy White, Clear and Matte Labels are ideal for indoor uses, like bottles on store shelves or packaging in use on the sales floor. Round corners mean when you apply your label, it peels easily. Once it's on your product, the edges won't start to curl. Custom shapes are our specialty, and we offer free kiss cuts for all of our custom product labels. Many products come in bottles and jars, from beverages to body care products. Since we see a lot of these product labels come through our shop, we'd like to share some information with you. Professionally labeling your products also adds durability to the shelf life you can expect from your packaging when your products are on display. This is particularly important for products with longer shelf lives, such as non-perishable products, or body care products which can become oily when your customers are using your products. Our Glossy White, Matte, and Clear Labels are printed on a durable polypropylene, which gives them a long life on your products, and a resistance to water and oils for packaging that will really stick. Be sure to get the right size of label for your bottles or jars. You can find more information on custom sticker sizes on our page How to Choose the Best Custom Sized Sticker or Label. Remember the curve in your product shape. If you plan on using a single label that will wrap around your bottle or jar, make sure your brand and product features are highlighted in the center of your label. This way your important product information will stand out when they are on display. 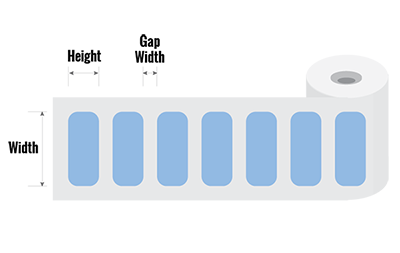 If you do not want to worry about aligning the edges of each label you apply, you can decrease the final width of your label in order to leave a small gap between the edges, once your labels are applied. Rolled labels can easily be applied by hand, or with a label application machine. If you do plan on using an application machine, you will also want to think about the orientation of your labels on the roll, since they may need to face a specific direction for your machine. For more details on the many ways we can orient your labels on the roll to make this process easier for you or take a look at our Custom Product Labels page for more details on these options. The same will also apply to the gap width between your labels. For hand application purposes, you don’t need to worry about the gaps between your labels, but an application machine may be more particular with the spacing between the labels on a roll. Our standard gap is ¼ of an inch between each label. Custom shapes are also a unique way to get all the product details you need on your label without crowding your branding or logo out of the design. While many bottle labels start as a standard rectangle, we also see many with tapered edges, larger centers, or incorporating blocks of color in the centers or on the edges, to make the details easier for customers to appreciate. Products packaged in jars also bring up questions such as; do you need to add a label to the lid? Use one label around the jar or bottle, or use multiple labels on the front and back? There really are a lot of options you can decide from. For many smaller jars and containers such as lotions or body care creams, the lid may even be a primary focus of the packaging depending on how your products will be displayed. This also makes for some valuable package real estate you can use for branding or sharing important information about your products. Going beyond matching the colors of your design (which we do with full color printing! ), we also have a variety of label types that also add their own features to labeling your products and complementing your packaging designs. Matte Labels can add a softer and non-glare finish, which is nice for products with a natural or traditional appeal in their branding. We also have Glossy White Labels, which add a bit of shine to any custom label design, and utilize a white material so your designs will stand out, even on dark surfaces. Clear Labels will highlight the product behind your label, as well as your branding and product features on the label. Whether you are adding an accent to your products, or getting an entirely new line ready for launch, custom product labels are an excellent way to set a professional tone in any setting your products will find themselves in.